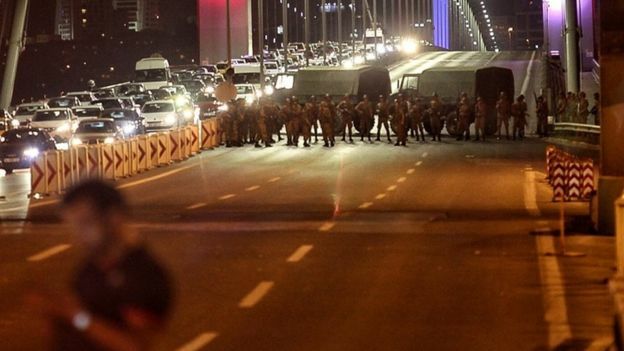 Within days of the failed military coup attempt, president Erdogan announced his “good news” to the Turkish public: a state of emergency for three months. It’s been exceedingly difficult to identify with any of the protagonists of the last couple of weeks in Turkey. Essentially, what happened were two coups in quick succession: one—abortive military, the other—successful civilian and still ongoing. Given Turkey’s experience of military coups, the former augured nothing good. The days of progressive officers overthrowing autocratic governments and introducing democratizing reforms—a la Nasser, Hafizullah Amin, or Chavez—are gone, and at any rate, today’s Turkey is not the place where they—if they still existed—could have led one. 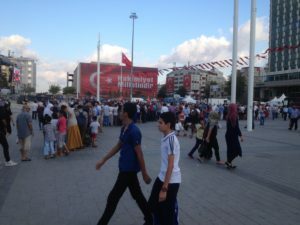 While some Western media initially presented the putchists as the virtuous secularist resistance against Erdogan, it subsequently emerged that some of the generals involved in the events of July 15th / 16th made numerous calls to their subordinates to show no mercy in crushing civilian resistance while others had previously been in charge of pacifying rebellious Kurdish towns. And as tempting as a vision of the country without Erdogan was, among the Turkish left there was little illusion that anything better could come out of the military, as reflected by their unanimous condemnations of that coup. While the principles of organization and the overriding vision of the coup leaders remain to be fully understood, as the investigation is in the hands of the party-state determined to attribute them to the Pennsylvania-based preacher Fethullah Gulen and what it calls the Fethullah Terrorist Organization (FETO), we will probably never know for sure. The main hypothesis with which serious journalists and experts are working is that a core of Gulenist generals, allied with a motley group of Kemalists and opportunists, attempted a pre-emptive strike just as they were about to be purged from the army. Needless to say, there was little to unite them ideologically except for a common enemy in the figure of Erdogan and his government. The second coup—conducted on the pretext offered by the first—has been more successful because it was not recognized as such. It is being led by the victorious president, who without missing a beat set about reshaping the Turkish state, both in terms of its personnel and its constitution. Unlike the army’s coup, this was much more thoroughly prepared, as is evident from the detention lists numbering thousands of names, first from the army (which is understandable) and then from the judiciary, then the staff of various ministries, then university faculty, schools and so on. Every day of the current state of emergency comes with new detentions, suspensions, and closures. Yesterday it turned out that Turkish theater was infested with coup plotters. The day before a doctors’ plot was uncovered. It’s difficult to catch up. The slogan of this purge is the cleansing of the country from Gulenist coup-plotters, but as the Turkish saying goes, “the wet wood burns alongside with the dry wood,” and one can hardly expect the state or its individual institutions to limit themselves to Gulenists—a very difficult group to identify in the first place. The vast majority of teachers, students, trade unionists, journalists at the 1,000 schools, 15 universities, 18 trade unions, 16 TV stations, 60 newspapers and magazines accused of Gulenist affiliation and thus closed over the last several days most likely had nothing to do with the Gulen movement and it’s highly doubtful whether those who did had anything to do with the coup. Countless of lives are being derailed and bureaucracies reset. The next step—the one that has not yet been taken, but that will surely be—will involve changing the state’s constitution and removing the checks-and-balances that have hitherto restricted AKP’s control of the state. Indeed, for all the talk of Erdogan’s authoritarian rule, many foreign observers don’t appreciate the full extent of institutional constraints the AKP party had faced in taking over the Turkish state over its 14 years in power. A political Islamist party, it had to wait for a decade in power before it could lift restrictions on wearing the veil in state universities and other public spaces. In 2008, the Constitutional Court very narrowly ruled against AKP’s closure on the grounds of its violating Turkey’s secularist constitution. Erdogan’s dream of a presidential republic—with him in charge—has so far been frustrated because of AKP’s absence of a constitutional majority. Besides, certain state employees, for example, such as kadro university faculty, were very hard to dismiss. Certain universities were hard to control. Certain civil society organizations retained autonomy. Those will now be severely curtailed. Symbolically justifying the merger of its own institutions/ personnel with those of the state, AKP has now begun a full-fledged privatization of Turkish nationalism. Again, this assertion may seem at first sight a truism: most political parties, and especially ruling ones, strive to speak for and represent the whole nation. But when it came to power in the 2002 elections, AKP enjoyed a somewhat tense relationship with the dominant brand of Turkish nationalism. Its initial (if timid) acknowledgement of the plurality of Turkish society, of the existence of Kurdish people with their distinct culture and rights, distinguished it from other parliamentary parties of the 1990s and 2000s. This early inclusive phase brought into its fold a significant number of liberals, traditionally apprehensive of the excesses of Turkish nationalism, and many Kurds, who for the first time saw a major political party acknowledging “the Kurdish problem.” The spectacular end of these alliances was marked by the 2013 Gezi protests and the Turkish state’s resumption of its war against PKK in 2015. After the latter, especially, and the realization that its Kurdish vote was now lost to People’s Democratic Party (HDP), AKP entered into a competition for the hardline Turkish nationalist vote. The defeat of the military coup is now completing this process of AKP’s appropriation of Turkish nationalism. A controversial (if mildly idiotic) AKP advertisement spot, previously banned by the Turkish electoral commission for its use of national symbols, is now being played on all of Istanbul’s public transportation screens, of which there are many. All manner of billboards and screens in public transportation proclaim the unity of the nation. Flags are literally covering the sides of many buildings—public as well as residential. 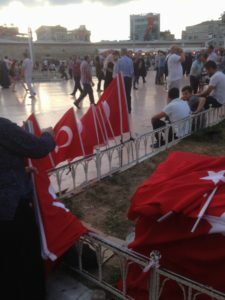 Since the 1980 coup—or maybe ever since the very inception of the Republic—Turkey has not suffered from a shortage of flags, but these new ones feel somewhat different. No Ataturk image—the standard of Kemalist nationalism—is to be seen next to them. Marking themselves with these flags, carrying them as t-shirts, shrouds, bandanas, or just waving them from their car windows, a new social formation has emerged, which constitutes one of the main mysteries of the last two weeks. Who were the masses that appeared on the street in the night of July 15 and could be still seen (if in diminishing numbers) now? Together with the police, these masses were central to defeating the coup and sustained the majority of the over 300 dead and 2,100 wounded. Some have celebrated them as saviors of Turkish democracy and certainly no one can deny the courage of those who faced the tanks and armed soldiers in that long night. Others, such as one of the most perceptive analysts of Turkish society and political economy, Cihan Tugal, have offered a much darker interpretations, seeing in these flag-waving men the heirs to the fascist masses of the 1920s and 30s, responding to the leader’s call for mass mobilization. Such readings could be supported by alarming reports over July 16th and 17th of some of these victorious “democracy defenders” going into Alevi or Kurdish neighborhoods to conduct mini-pogroms. The state has deployed its resources to sustain their presence on the streets, organizing anti-coup rallies with free food, offering free transportation and presumably other incentives. In the absence of any sociological studies of this group so far, we are left with questions: is this the Islamists’ Gezi? Are these masses AKP supporters—the hitherto silent majority, which only becomes visible on election nights—finally claiming the streets? Or are they—as suggested in Justus Links’ recent n+1 piece—politically and socially heterogeneous groups only brought together by an event of such magnitude? We Asked: Geopolitics & the Left, P ..
We Asked: Geopolitics and the Left (Part .. Premature Postcolonialists: the Afro-Asi .. The Freedom to Say “No”: Interview w .. Dangerous Liaisons: Ukraine and the West ..
Where is the Turkish left in all this? The overwhelming sense is that right now is not our move. 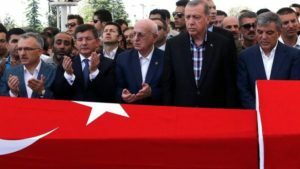 It is at best uncomfortable to march alongside the flag-waving masses and impossible to join their chants calling for the hanging the Gulenist dogs and for the unity of the Turkish nation. At this stage of Erdogan’s consolidation of power, the left is not the explicit targets, but the political space available for them is shrinking by the day and their turn will surely come. After the solidarities of the Gezi moment, socialist, feminist, environmental organizations have all drifted apart and the mass mobilization of supporters they witnessed gradually came to an end. But this piece is not so much addressed to our Turkish comrades: this analysis would be already quite familiar to them and they know better than anyone from the outside what to do. Rather, the “what is to be done” here is a quick list of ideas addressed to leftists outside of Turkey: translate the work of our local comrades, thus amplifying their voices internationally, send those in danger of arrest (and not only) visa invitations, keep track of and conduct campaigns around those already in prison (even in more peaceful times, there is a fair number of political prisoners in Turkey; now the list is growing exponentially), or otherwise support certain vulnerable groups. Turkish academics critical of the regime, for example,–the group that I happen to be most familiar with,–need the conference invitations, fellowships, and jobs you can offer. You can organize a solidarity petition from within your scholarly association, or as a minimum, sign one; arrange a scholar-at-risk at your university. Those who signed the Academics for Peace petition “We Will not Be Party to This Crime“, for example, condemned by Erdogan as traitors this January and promised retribution (lifetime unemployability in Turkey), should be regarded by the international scholarly community as a go-to invitee list. Similar appeals could be made on behalf of Turkish journalists, school teachers, trade unionists, and other professional groups targeted by the state. All of these ideas—and many more that simply did not occur to this author–are time-consuming, troublesome, and highly inconvenient, but that’s what international solidarity is. 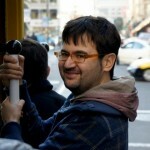 Rossen Djagalov is an Assistant Professor of Russian and Slavic Studies at the New York University. Formerly an organizer for Yale’s graduate student union (GESO), he works on representations of labor and international leftist culture in general.